adjustments for the growing brain. As the infant grows and develops, the sutures close, forming a solid piece of bone, called the skull. Craniosynostosis is a condition in which the sutures close prematurely, causing problems with normal brain and skull growth and premature closure of the fontanelles (soft spots). Premature closure of the sutures may also cause the pressure inside of the head to increase and the skull or facial bones to change from a normal, symmetrical appearance. What are the symptoms? The most common sign of craniosynostosis is an oddly shaped head at birth or by the time the child is a few months old. For example, the skull may become long and narrow. Or it may be very flat and broad in front or back or on the sides. This oddly shaped head may be the only sign of craniosynostosis. In rare cases, the deformity causes pressure to build up on the baby’s brain. This can cause brain damage and can make the baby develop more slowly than other children. Sagittal Craniosynostosis is the most common type of Cranioysnostosis (40%-58% of all cranio cases) and effects more males than females. Early closure of the sagittal suture results in scaphocephaly. Infants will often have a protruding forehead, an elongated head, and protruding at the back of the skull. Coronal Craniosynostosis is the second most common form of Craniosynostosis and effects mostly females. Coronal synostosis may occur on either side or may be bilateral. Infant will often have an elevation of the eye socket, flattening of the ridge of the eye and displacement of the nose on the affected side. Metopic Craniosynostosis Metopic synostosis is the third most common form of Craniosynostosis and is associated with trigonocephaly with a male preponderance. The metopic suture is located between the soft spot and the nose. Early closure of this suture results in trigoncephaly. Infants will often have a prominent ridge down the middle of the forehead, a pointed forehead, and eyes that seem too close together. Lambdoid Craniosynostosis is one of the most rare type of Craniosynostosis. Most cases of lambdoid craniosynostosis are unilateral and result in asymmetric posterior plagiocephaly that needs to be differentiated from positional plagiocephaly. Frontosphenoidal synostosis is one of the most rare types of Craniosynostosis. It is the small suture close to the eye socket. Premature closure of this suture will result in flattening on the side of the front of the head and can cause an indentation near the temple or eyebrow bones. Frontosphenoidal appears almost exactly like coronal craniosynostosis but the coronal sutures are open. This is believed to be one of the most undiagnosed forms of cranio as a child can appear to have coronal synostosis or positional plagiocephaly but the CT scans will show the sutures are not fused and the child will not be diagnosed correctly. 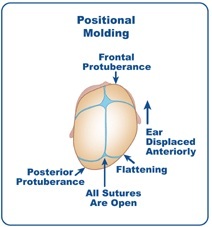 Craniosynostosis of multiple sutures accounts for approximately 5% of craniosynostosis. A child can have two or more sutures fused prematurely and is a more complex form of craniosynostosis. Complex craniosynostosis frequently causes increased inter cranial pressure and is associated with developmental delay and a high rate of re-operation. Plagiocephaly (PLAY-gee-oh-SEF-uh-lee) is a flat spot on the back or side of a baby’s head. It is caused by pressure on the bones of the skull before or after birth. This usually happens because of the way a baby likes to lie (their positional preference) in their first few months of life. There are many things that could cause positional plagiocephaly. Children with multiple medical problems or delayed development may have a hard time changing positions. They are more likely to develop positional plagiocephaly than children who can move around more. Some infants have a strong preference to look in one direction. This can lead to a limited range of motion in the neck from muscles being tight. This is called torticollis. Babies with torticollis might be more likely to develop plagiocephaly than other babies, since they always rest on the same spot on the back of their head. Premature infants are sometimes more likely to develop plagiocephaly. This is because their skull bones are softer than the skulls of babies born at full term. They also tend to move their heads less often. Positional Plagiocephaly does not require surgery and can usually be fixed by repositioning of the babies head while they lay down or sleep and some may require the use of a helmet.